MHFA Become a Mental Health First Aider! This can be delivered as an 'In House Course' for Companies or as an 'Open Course' for Freelancers, Professionals or Members of the Public with a genuine interest in Mental Health & the Wellbeing of others. You can view the course agenda & understand the first aider role by clicking the relevant headers at the bottom of this webpage. MHFA England value the 2 Day Adult course at £300 per person & the 1 Day Adult course at £200 per person. These courses are provided Locally & Nationally throughout England. We offer the 2 Day Adult course, 1 Day Champion & 1/2 Day Awareness courses. Notes: Full Materials, Resources, Refreshments & Buffet Lunch will be provided all inclusive for the 2 days. Notes: Full Materials, Refreshments & Buffet Lunch will be provided all inclusive for the 2 days. *Further Venues to be Announced. Final costs will vary subject to location & venue fees. 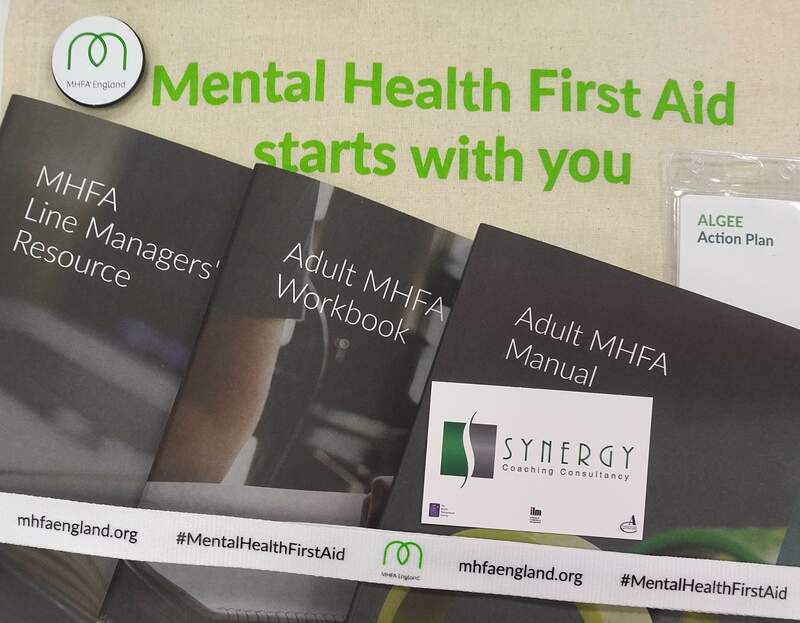 ** This product is licensed by MHFA England and is subject to a min and max number of attendees; should these numbers not be secured no later than 10 days prior to event dates than Synergy Coaching Consultancy reserves the right to withdraw course dates, offering alternative dates or full refunds. As the attendee should you wish to cancel no later than 21 days prior to your course date, you'll receive a full refund. Cancelling within 21 days will result in a 70 percent refund or cancelling within 14 days will result in a 50 percent refund of your original payment. Respectfully, cancellation fees are to cover in part materials already ordered and venue fees incurred. ***Organisational courses are quoted on the bases that the Organisation is providing the venue, refreshments and lunch for it's own attendees. Unless the Organisation has stated that it wishes us to make those arrangements. Synergy Coaching Consultancy will provide the Full materials and qualified trainer. ****Attendees must attend the Full two days to ensure completion and receive certification.